Anyone familiar with the Harvest Moon series will feel right at home with the opening sequence of Stardew Valley. You begin as a young adult deciding to abandon the big city for a small town in the country, inheriting little more than a patch of dilapidated land, a “crusty” cottage, and a set of rusty old tools from your late grandfather. Not only is this premise much the same as Harvest Moon, but with its 2D cutesy art style, it looks very similar as well. After creating a character and naming your farm you are dropped into your new life with only a few packets of seeds, and a brief chat with the mayor to guide you on where to begin. Again, much like in Harvest Moon, after exploring the local town and meeting its residents your options soon open up. New tools are gifted to you by kind strangers, new buildings and machines become available, and entirely new areas of the map reveal themselves as time progresses, all of which unlock new ways for you to line your pockets. A pleasant surprise comes in the form of a crafting menu, something the old school Harvest Moon games never had. Here you can build chests, paths, and fences along with some more unusual items like bee hives and mayonnaise machines, simply using the materials in your inventory. As you progress more blueprints will unlock giving you more and more crafting options, although new buildings and home extensions still require the help of the local carpenter, Robin. 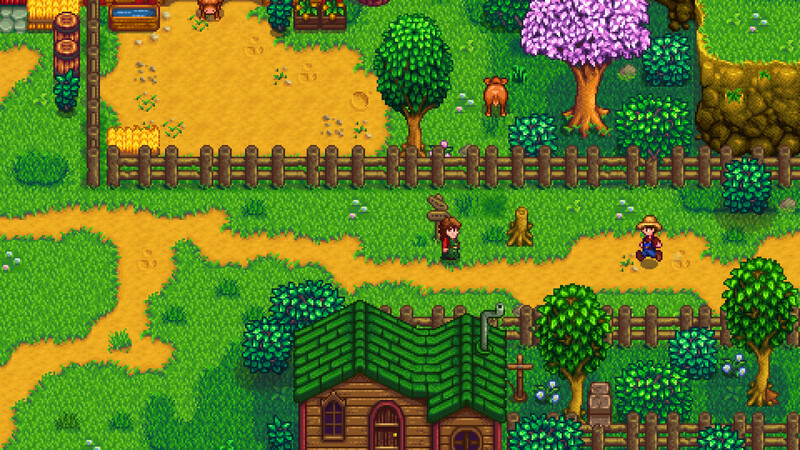 By the end of my first spring as a farmer I was generating income from planting crops, tending to chickens, foraging for plants and seashells, mining, fishing, and slaying monsters (it surprised me too), although selling my home-grown produce was by far the biggest money maker and I abandoned fishing early on when I realised I was terrible at it. 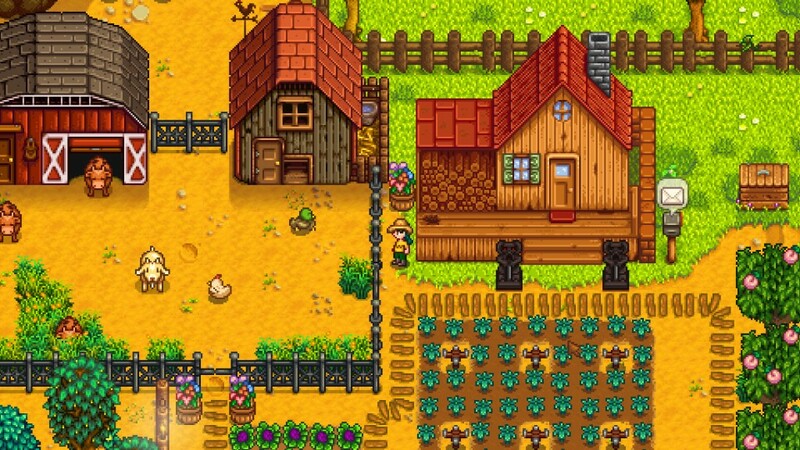 This range of activities mean that no two days in Stardew Valley feel the same and I found myself constantly wanting to play “just one more” before I put down the controller and move to the countryside. To further break up the monotony of running a farm the townsfolk will regularly provide you with quests to complete and events to attend, should you so desire. These quests are fairly simple: requiring you to catch a specific fish or grow a certain kind of crop to complete the majority and with small rewards. This meant that I rarely found myself planning my day around them but they do provide a pleasant bonus should you happen to come across the item as you play or, even better, already have it in your inventory. As for the events, these provide a good way of meeting and conversing with each of the many townsfolk and fit in perfectly with the charm of the game, asking you to hunt for eggs or perform a “flower dance” in front of the crowd. Although you are not required to attend these, they do mean that the town completely shuts down for the day. Bear this in mind as it can put a frustrating spanner in the works of your plans the first time it happens – like when you want to build a feed silo but Robin has decided she’s having the day off. Forming relationships with these locals follows a fairly simple premise: you give them presents. Not just any gift will do, and you have to figure out what each person likes through trial and error (or a wiki guide). Irritatingly though, the number of gifts you can give each resident is limited to two per week and once per day, so this is easier said than done. Once you’ve found one thing they like, you are well on your way to making a new friend. 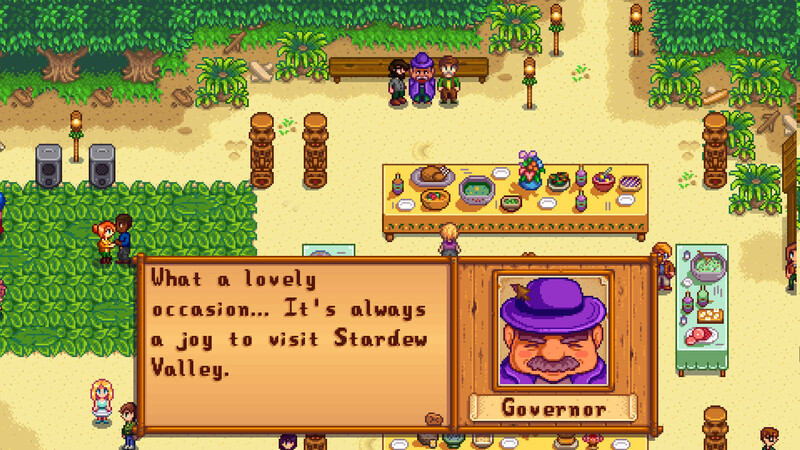 The larger issue with making friends in Stardew Valley is actually finding them. Unless the individual you want to talk to happens to be at home there is no indication of where they are at any given time, even the business owners seemed to arbitrarily wander off when I needed them most. This means that your only options are to memorise the schedule of anyone that interests you as a friend/romantic partner, or simply hope that you bump into them as you go about your day. Making the effort will net you some rewards in the form of new recipes in the post (and potentially a spouse), but still, a friend locator would have been a nice touch. Charming old school art style. Short days make it tough to put down. Little guidance for unfamiliar players.